This months winner will be sent the Your Next Stamp prize package. Ok decided to do things a tad different!! 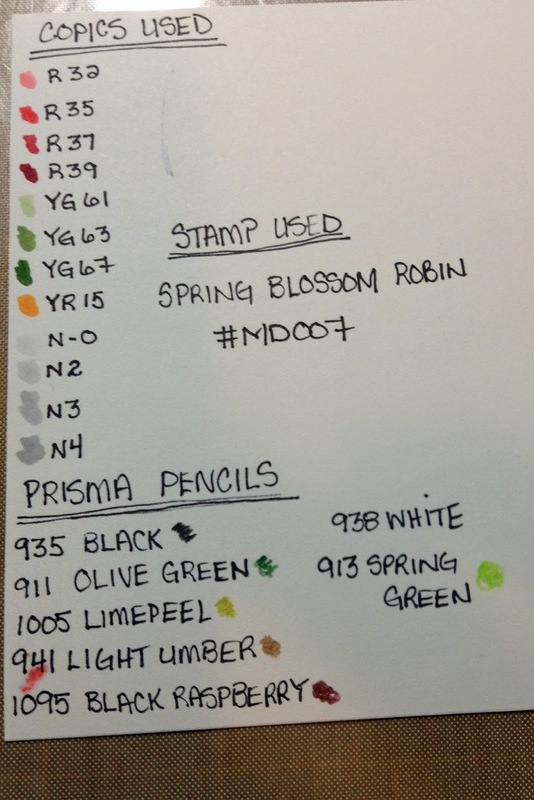 Above is a list of the COPICS & PRISMA PENCILS I used to colour in this image..As well the name of the image along with the Item number..I used MEMENTO TUXEDO BLACK INK on white card stock to reproduce the image..All of these supplies can be found at ONE CRAZY STAMPER..this is my one stop shop and I must admit I do love those gals they are awesome...Speedy as well.. Wacky Wednesday is here again and for today's post at One Crazy Stamper, I have used this adorable stamp called Rosalie from Your Next Stamp. 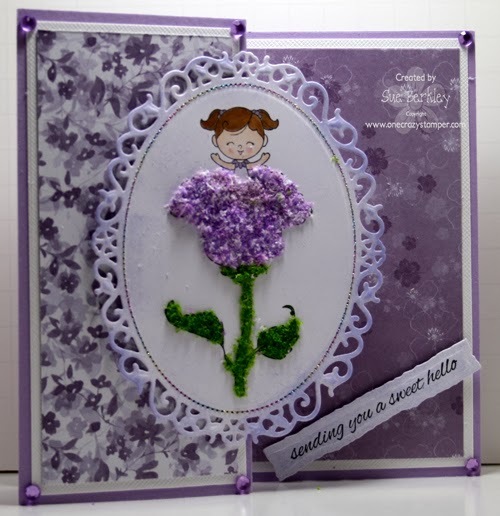 I am also will be showing how to use this neat product called Flower Soft. 1. After stamping the image with Tsukineko Memento Tuxedo Black, I coloured it with the Copic Markers. 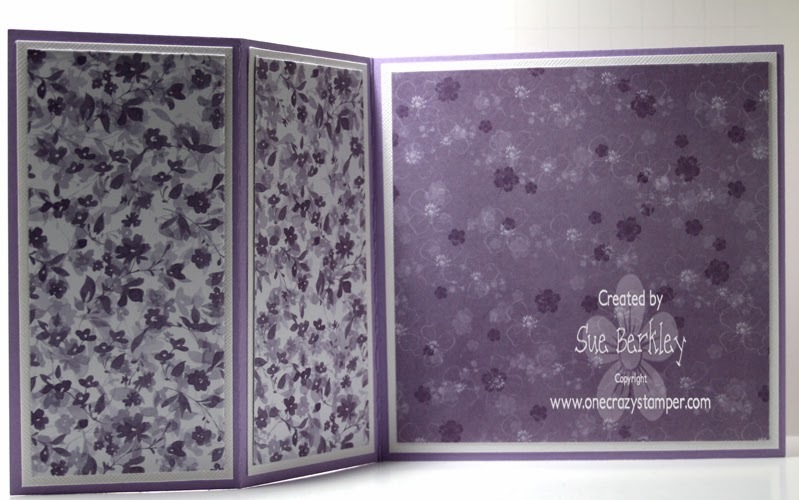 The image was then cut using the Floral Oval die from Spellbinders. 2. Back stitch using the metallic thread. 3. 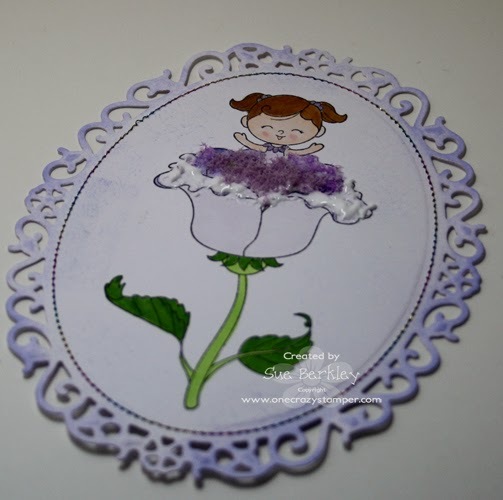 Add Lilac Distress ink to the border. 4. Adding the Flower Soft. Flower Soft comes in several colours mixed and single as well as ultra fine. i. Crocus, lilac and shamrock green were slowly added to certain areas of the image. To obtain the results you would like, make sure to use the Flower Soft glue as it water soluble but also extra thick. ii. Add the Flower Soft in sections and only do one colour at a time, otherwise the colours can become mixed and unless you want that particular combination not usable. iii. The Flower Soft glue bottle has a long point which is just snipped at the top to allow the glue to flow. iv. As the Flower Soft is quite compact in the jars, add some to a container and break it up to make it fluffy. Add a bit of glue to the area you want to start with. v. I added Lilac to a small area at the top; then pressed it down and shook off the excess. I then added more glue to the original image and added Crocus which is a combination of white, light and dark shades of crocus. vi. Once the Crocus has been added to the flower part, then add Shamrock Green to the leaves and stem of the flower. Cut a 6" x 12" card base and score at 6" and 9"
Saturday, as it is February 1st will be the start of a brand new challenge. 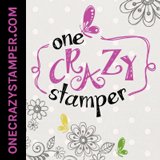 Check out Lora's store at One Crazy Stamper to see what is new and arriving daily. 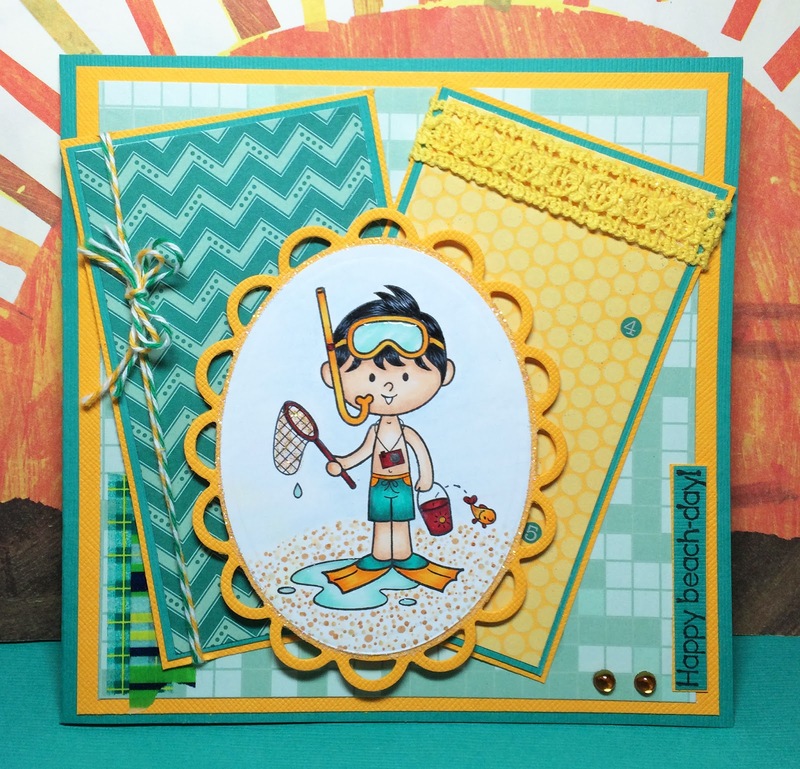 This month has been a lot of fun working with One Crazy Stamper's sponsor images by YOUR NEXT STAMP, and my last card for the month features the Cool Beach Owl Set. For the card front I decided to use my Copic Airbrush System to create a beach scene, using BG01, BG02, and E55. I then colored the image with my Copic Sketch markers, fussy cut it, and popped it up on the card front. I added white highlights with the Sakura white glaze pen, and used one of the included sentiments from the stamp set to make a frame around the card. The sun accent is from my stash! 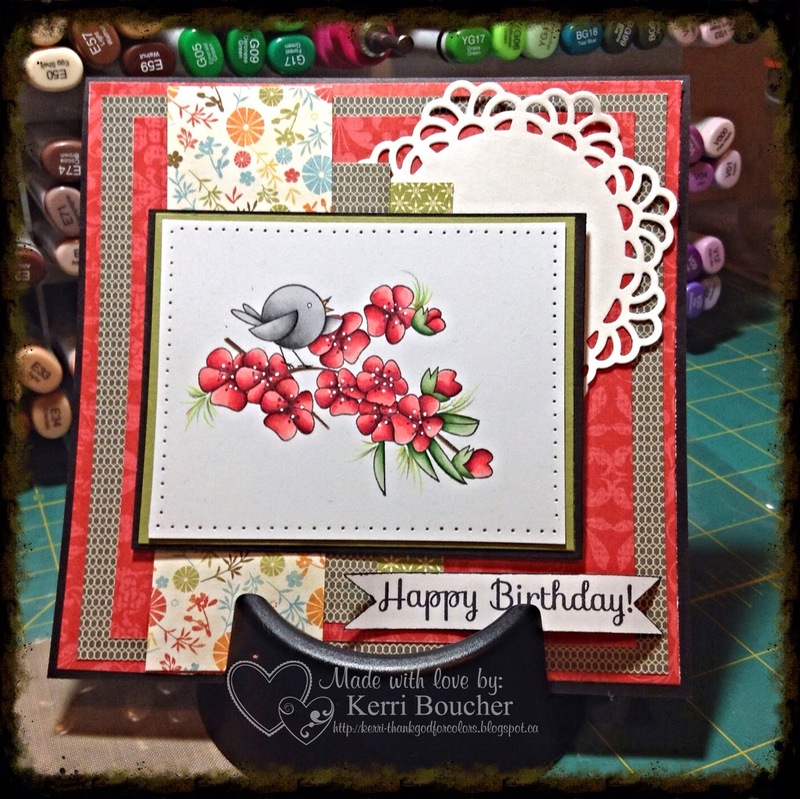 You still have a couple of days to enter the ANYTHING GOES challenge here at One Crazy Stamper for a chance to win a fabulous prize. Good Times everyone, at One Crazy Stamper we are having our Anything Goes challenge still going on. So please play along, always great seeing what everyone is creating. The Company we are show casing this month is "Your Next Stamp". Awesomeness for sure. I do hope you get into your craft room and roll out something fantastic. I used the image from the Quirky Animals again, this set is so much fun, your really have to check it out. I think they are all so cute. Till next time Happy Crafting! Supplies: Stamps-Your Next Stamp-Quirky Animals, Copic Markers-C9, C7, YR07, YR04, R05, R08, B95, B97, B99, RV09, RV04, Y21, Y23. It's a spectacular Saturday at One Crazy Stamper, and I have a silly monster image to share on a bookmark. If you like this, check out my tutorial I posted awhile back. 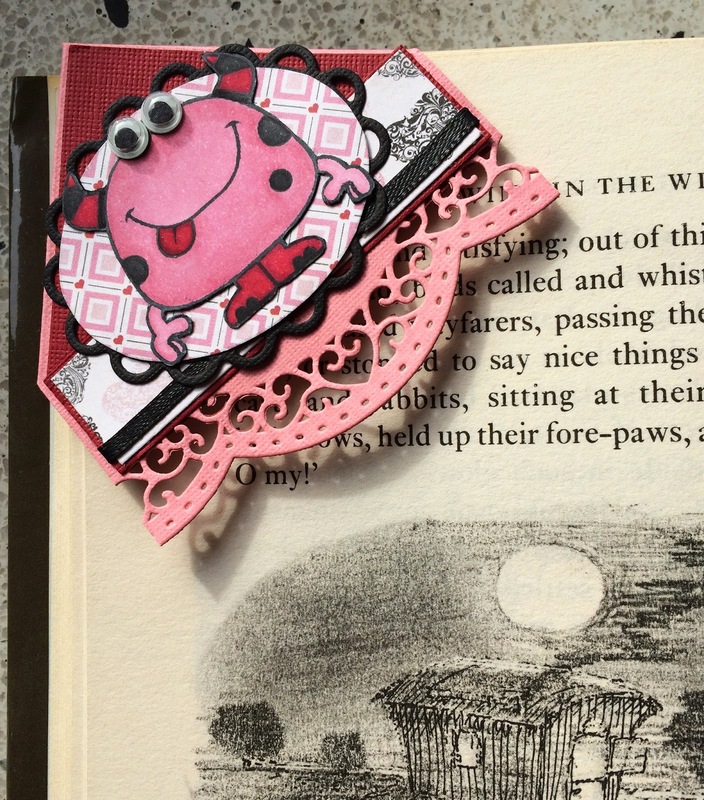 I did a valentines day themed bookmark, and used some of my all time fav Valentines day paper. I coloured this silly monster with my copics and glued on goggly eyes, so silly right? 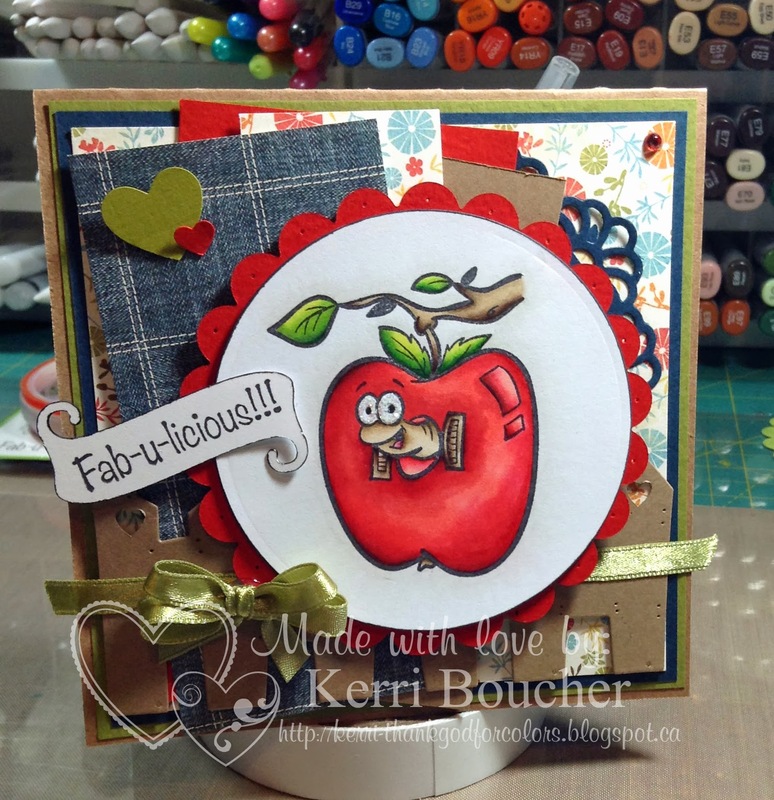 Have a fabulous day, get crafty and join our "Anything Goes" challenge! Thanks for visiting today, hope to see you back soon! 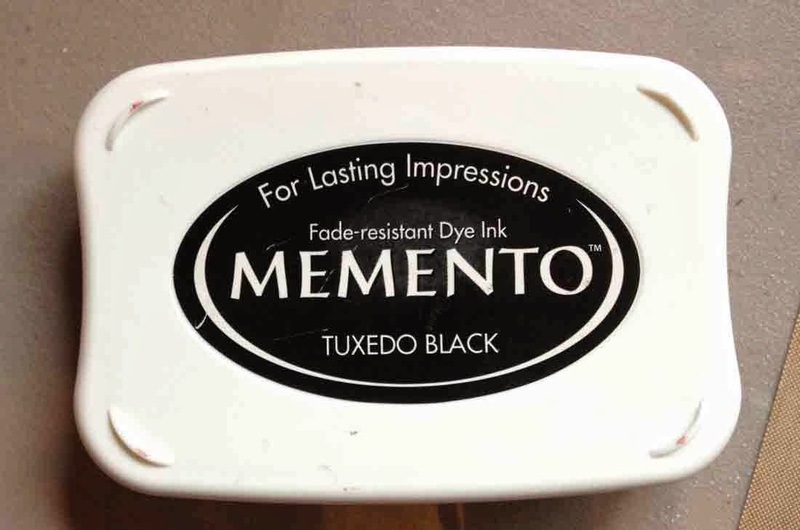 Black Ink Used to stamp Image!! Welcome to another Wacky Wednesday and this past week has definitely been wacky in more ways than one. We are showcasing Your Next Stamp as the featured stamp company for this month and the theme is "Anything Goes" For today's post for One Crazy Stamper, I have used this adorable stamp set called Critter Crew Two, from Your Next Stamp. 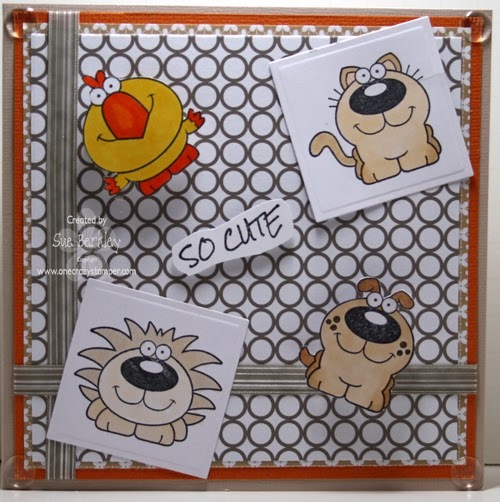 This set includes: Beakers the Bird, Cookie the Cat, Spiffy the porcupine/lion, hedgehog and Freckles the dog. I added wobbles to Beakers and Freckles. 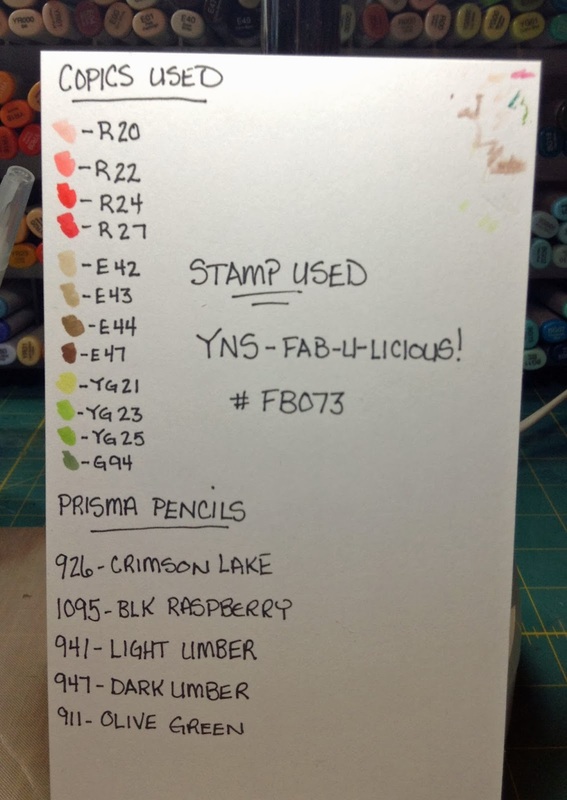 Miscellaneous: YNS Gumdrops (Your Next Stamp). By entering one of your projects to this month's "Anything Goes" challenge, you will have a chance to win a prize from Your Next Stamp. 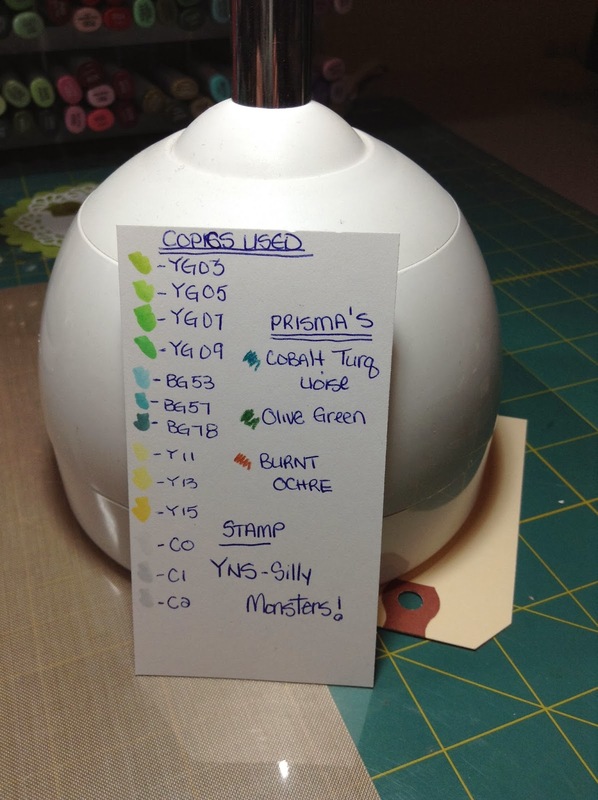 While you are crafting, take a break and check out Lora's store One Crazy Stamper for some amazing new products with great prices. It's Terrific Tuesday Time again for One Crazy Stamper, and my card this month features an adorable image from our sponsor this month which is YOUR NEXT STAMP. Be sure to check out the design team blog and then get crafting to enter this months challenge theme of ANYTHING GOES! For full details click here. This sweet image is the YNS image Kyle the Koala Bear, which I colored with Copics. I started by coloring the body, and then using the terry towel technique with Copic Blender Solution, creating the fur texture of the bear. 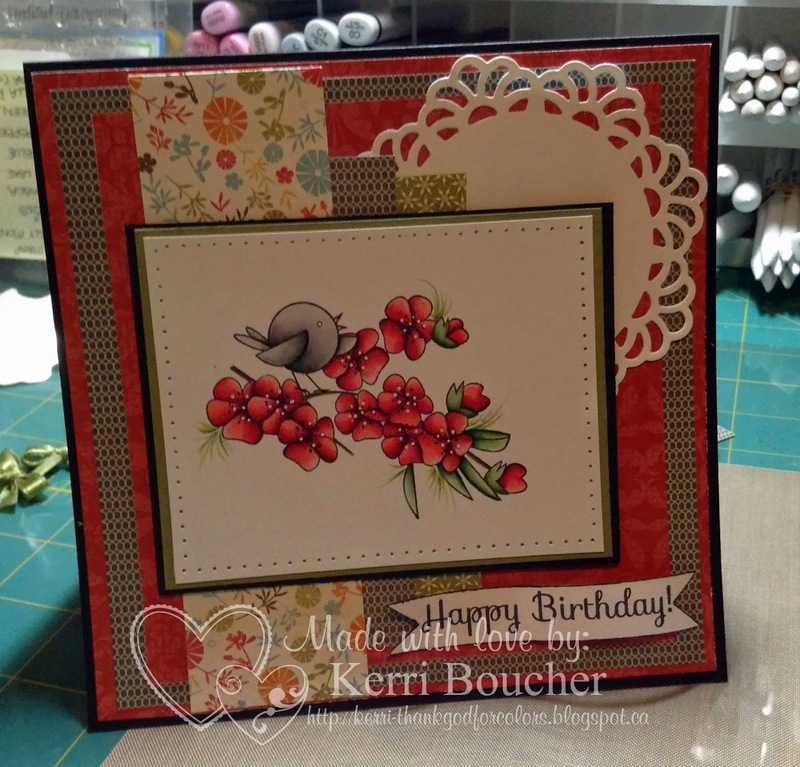 After completing the coloring I used a Spellbinder die to cut out and mat the image. The dp is from an older Authentique collection, while both of the sentiments are included with the image. 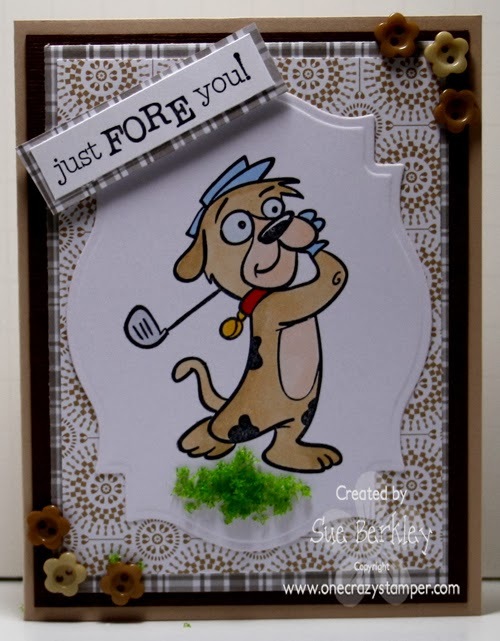 Check out the rest of the design teams wonderful creations using the YOUR NEXT STAMP company images, and don't forget to leave us some comments as we all like to receive feedback on our work. Go Nuts! It's your birthday! "Your Next Stamp" company is what we are show casing at One Crazy Stamper this month and our challenge is Anything Goes. My card was so fun to make, he is so cute to color. The package has a few more cute ones in it called Quirky Animals. Great job! Thanks for stopping, please take some time to go to the design teams and share some love, they all work so hard at One Crazy Stamper. Also stop by Lora's store and do some much fun retail shopping. Till next time happy crafting and I hope you get in your craft room soon. Supplies: Stamp-Your Next Stamp, Ribbon, Embossing Folder, Copic Markers-E41, E43, E23, E25, E29, E79, 0. Hey hey crafty friends! Check out this cutie pie of a guy, I coloured him with copic markers, added stickles to the net, glossy accents to the goggles and puddle, a little bit of glitter around the oval die, stuck some washi tape on the dp, tied on two colours of bakers twine and then added jewels and lace. I also used a few copics to make the sand and used prismacolour pencils for the sky. Have a great day and get crafty and join in on the fun with our "Anything Goes" challenge. Oh BTW its also my birthday! Hello and Happy Friday! Today I have two very fun cards to show to you that I made using two of the images from the "Your Next Stamp, Smiley Happy Critter Crew Set". Well I hope you enjoyed both cards today! Now this little guy has lots of eyes!! 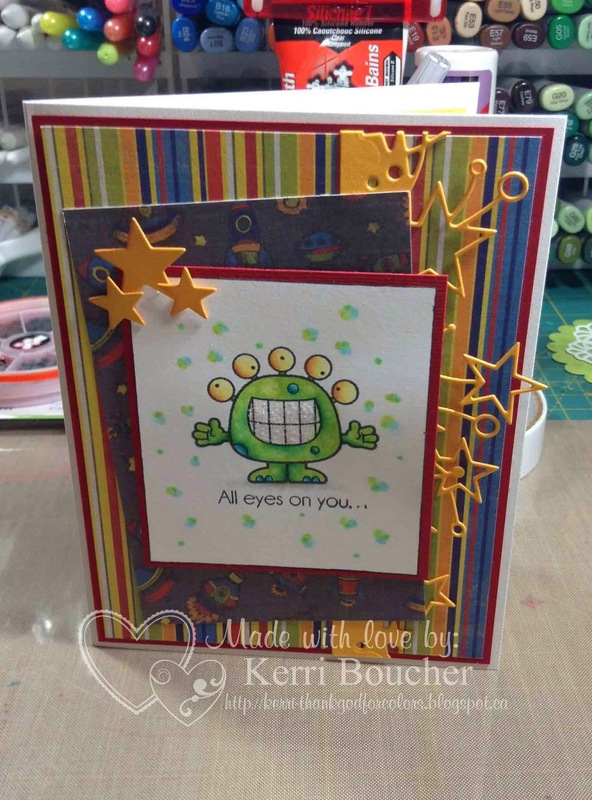 He is from the SILLY MONSTERS SET from YOUR NEXT STAMP!! I am really in a monster mood.I stamped it with MEMENTO TUXEDO BLACK INK onto White Card Stock..I coloured the image with COPICS..Of course they are a couple of PRISMA PENCILS I used as well. If you can see his teeth they shine with GLITTER. STAR DUST STICKLES to be exact!! All of these supplies can be found at one amazing location. ONE CRAZY STAMPER. Welcome to another Wacky Wednesday and things are definitely wacky at times. I'm beginning to wonder if I should possibly take this sport up. I would have no idea where the ball would fall. For today's post for One Crazy Stamper, I have used this cute and adorable stamp called Zach from our featured company Your Next Stamp. Where Did My Day Go! !